Anyone can download and play for free next week. 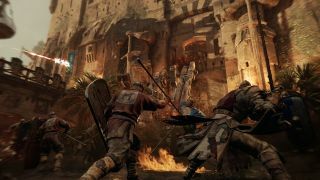 Ubisoft’s multiplayer swordfighting game For Honor is opening up its upcoming Marching Fire expansion for testing next week. The expansion, which adds playable warriors from China and a new 4v4 “Breach” mode, is scheduled for launch on October 16. But the open test will allow players to get hands-on with most of its new features from September 6 until September 10. The open test is available to anyone, including people who don’t own the game. It lets players battle with all 22 fighters, including the four new “Wu-Lin” fighters included in the Marching Fire expansion. Based around warriors from historical China, the new roster includes Shaolin Monks, who fight with a staff, and the Nuxia, who carve up opponents with a hooksword and “disguise their talents through dance” according to the Marching Fire site. In addition, the test will allow players to explore the expansion’s three maps—Walled City, Hallowed Bastion, and the moody Kazan Castle. Presumably these will all be playable in the expansion Breach mode, which is a team-based mode centred around castle sieges. In Breach, Attackers must assault the castle using a battering ram, while defenders can call upon ballistas, teams of archers, and nasty-sounding “fire cauldrons” to keep the attacking forces at bay. This can be played PvP or PvAI. Here’s a full, visual rundown of the open beta’s features. The open test will also let players experiment with several smaller features. “Perks” will replace the equipment-based stat-boosts currently in-game, new victory poses for winning teams, while fighters will now engage in brief SoulCalibur-style dialogue exchanges before duels. The E3 gameplay trailer for Marching Fire is below for your perusal. When Marching Fire launches on October 16, the Breach mode will be immediately available to everyone, while the additional characters will be purchasable by non-expansion owners using (lots of) in-game credits one month after the expansion’s release.